Every recursively enumerable set of integers (r.e. set) is enumerable by a primitive recursive function. But if the enumeration is required to be one-one, only a proper subset of all r.e. sets qualify. Starting from a collection of total recursive functions containing the primitive recursive functions, we thus define a sub-computability as an enumeration of the r.e. sets that are themselves one-one enumerable by total functions of the given collection. Notions similar to the classical computability ones are introduced and variants of the classical theorems are shown. We also introduce sub-reducibilities and study the related completeness notions. One of the striking results is the existence of natural (recursive) sets which play the role of low (non-recursive) solutions to Post’s problem for these sub-reducibilities. 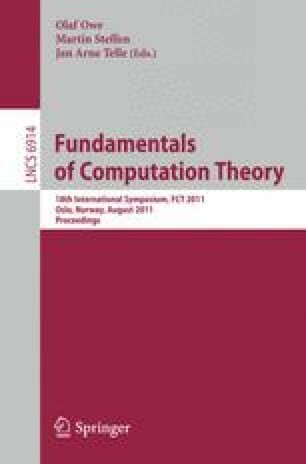 The similarity between sub-computabilities and (complete) computability is surprising, since there are so many missing r.e. sets in sub-computabilities. They can be seen as toy models of computability. The research presented in this paper has been made possible by the support of the French ANR grants NAFIT (ANR-08-DEFIS-008-01) and EMC (ANR-09-BLAN-0164-01).